These pocket wedding invitations are a great way to add a touch of posh elegance to your wedding without spending a fortune. And you only need the most basic of sewing skills to complete this project. 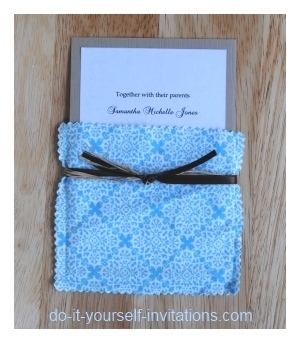 The pockets for this invite are made using fabric. There are so many patterns and textures to choose from when shopping for fabric that you can find something to match pretty much any style or color palette! Quilting fabrics especially come in some really beautiful and unique patterns and graphics. Be sure to shop around and keep an eye out for sales and coupons! I was able to make 100 of these invitations for only a little over $50.00 for the invitation alone. Talk about a deal! Fabric will vary in price depending on what you choose. My trick to save even more valuable dollars on this project? I always, always, do an internet search for printable or online coupons for any of the stores in which I might shop for fabric. I bought this fabric at Joann Fabrics and was lucky to find a 50% off coupon and ending up getting this fabric for a steal! Another great place to shop that has frequent deals and coupons is Fabric.com where they also happen to have a seriously fabulous selection to choose from. 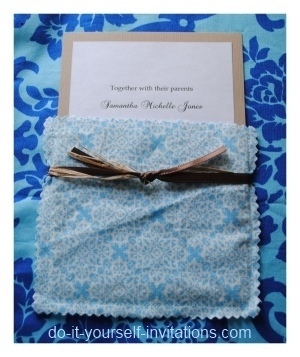 Well to make pocket wedding invitations you will need to make an invitation in which to fit the cloth pocket around. I made a very simple invitation of two layered papers. I printed the wording onto some nice white paper. I visited a local print shop and had the paper cut to size (in this case 4.5 x 6.5). I also had my cardstock cut down from 12" by 12" sheets to 5" by 7". I used a permanent adhesive glue runner to attach the two papers together, placing the white paper on top and centering it as best as I could. 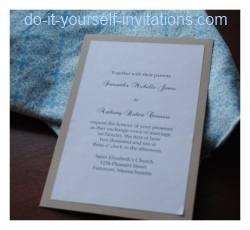 Now for the cloth pocket piece in which to fit your invitations. The easiest way to go about it would be to make a pattern of sorts. 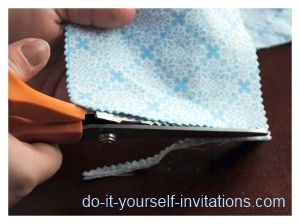 Simply measure your invitation across, and then figure out how deep you want the pocket to be. Add 1/2" to allow for seam allowance (you will be sewing 1/4" in from each edge, sides, top, and bottom). Now use those measurements to create a pattern piece form some good cardstock or a piece of cardboard. Lay your fabric down on a work surface (your kitchen table will do) so that it is still folded in half. For those new to sewing and fabric, it will come right off the bolt (roll) folded squarely in half. Lay your pattern piece up with the closest corner and bottom edge and cut through both layers of fabric with a pair of pinking shears to create two equal square shaped pieces. By the way, pinking shears are the funny chunky scissors that cut out a zig zag edge. They help keep the fabric so that it will not fray. 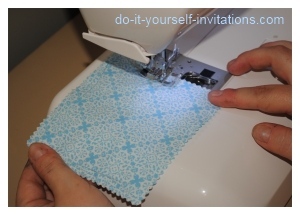 Next set up your sewing machine to sew the fabric to create a pocket. You will need to wind a bobbin with a matching or coordinating colored thread, as well as thread the machine. Always sew a few stitches onto some scrap pieces of the fabric you are using to make sure the settings of your machine (and the thread) agree with Your fabric. Sew the edges at a 1/4" in from the edges. When you reach 1/4" from the corner stop the machine and then pivot at the edges. To do this you simply make sure that the needle is in it's lowest position to hold the fabric in place. Lift the sewing foot, and then turn the fabric in the correct direction to continue sewing seamlessly down the next edge. Lower the sewing foot and then repeat this when you reach the next corner. When you reach the opposite end from where you started do a few backstitches and your done. Make sure to clip any stray threads. After sewing you may want to even run a hot iron over your pockets to make them very crisp and neat looking. 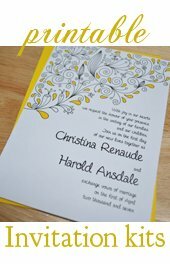 You could leave the fabric as is, and simply insert your wedding invitation stationery to create the pocket wedding invitations. I thought it lacked a little something, and wanted a really finished look, so I paired some raffia and satin ribbon together and tied a knot around the pocket securing it in front. You could even choose to use some gross grain ribbon, add a charm, or even a paper monogram tag.